Can Pancreatic Cancer Be Inherited? 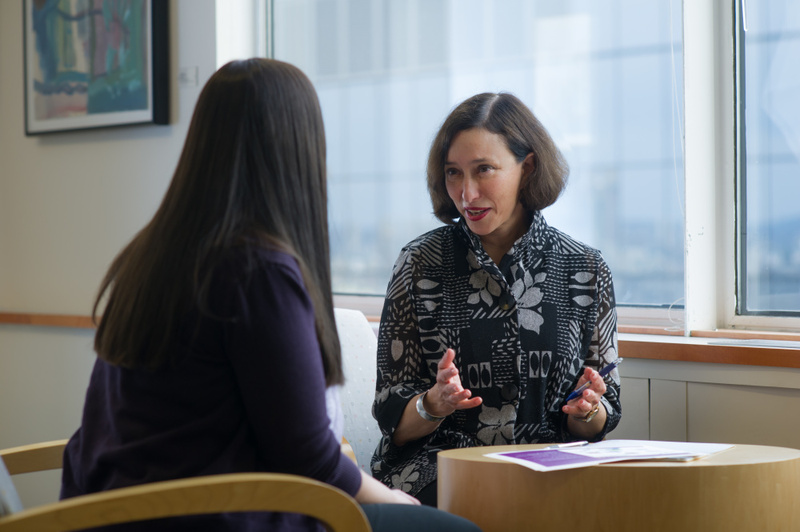 Counselors in Dana-Farber’s Center for Cancer Genetics and Prevention help patients assess their risk of hereditary cancers. Most cases of pancreatic cancer develop for unknown reasons, but about 10 percent occur in families that have a strong history of the disease. That doesn’t mean that if you are a member of such a family you will develop pancreatic cancer, but rather that you are at a higher risk for it. “Research has shown that familial pancreatic cancer is not as rare as we had thought,” says Matthew Yurgelun, MD, a specialist in Dana-Farber’s Gastrointestinal Cancer Treatment Center and in the Center for Cancer Genetics and Prevention Center. Pancreatic cancer, which is often deadly, is diagnosed in about 53,000 people in the United States each year. Factors such as older age, smoking, and obesity increase the risk. Familial pancreatic cancer, or FPC, refers to families in which at least three members, or two or more individuals who are first-degree relatives (a parent, child, or sibling) of one another, have been diagnosed with the disease. Healthy individuals in such families have an increased risk of developing the cancer during their lifetimes – several times higher than the 1.3 percent lifetime risk for non-familial pancreatic cancer. Inherited pancreatic cancer can be caused by many different gene mutations known as “germline” mutations. These mutations occur in sperm or egg cells, meaning that they are passed on to every cell in an offspring’s body during reproduction. A number of germline mutations can cause rare syndromes associated with several different cancers. For example, pancreatic tumors may develop in people with Lynch syndrome, which increases the risk of colorectal, endometrial, ovarian, liver, brain, and skin cancer. Pancreatic tumors are also seen in some individuals with breast and ovarian cancer syndromes caused by mutations in the BRCA1 or BRCA2 genes. Mutations in PALB2 and ATM genes are also found in some pancreatic cancer families. If a patient has a concerning family history of pancreatic and/or other cancers, Yurgelun explains, he or she is referred for genetic tests that can detect known mutations linked to various syndromes that can increase the risk of pancreatic cancer. Many individuals with strong family histories of pancreatic cancer, including many FPC families, will ultimately have “negative” genetic tests, but may still have an increased risk of pancreatic cancer and thus may still be candidates for specialized screening. Screening tests are aimed at detecting precancerous or early cancerous changes in the pancreas, in hopes of diagnosing the cancer at an early, more treatable stage. Annual screening for those at high risk because of family history, or because they harbor mutant genes associated with pancreatic cancer, is recommended beginning at age 50, or 10 years earlier than the age at which a close relative was diagnosed with pancreatic cancer, Yurgelun says. Two different screening tests can detect precancerous or early cancerous changes in the pancreas. In an endoscopic ultrasound, a thin, flexible tube is passed through the mouth into the first part of the small intestine at a point near the deep-seated pancreas. A probe at the tip of the tube captures images of the pancreas, and a hollow needle can be passed through the tube to take biopsy samples. The second screening test, magnetic resonance cholangiopancreatography (MRCP), works similar to a standard MRI scan. It takes images of the pancreas, but can’t be used to obtain biopsy samples. While these tests are used in alternating years to monitor patients at high risk for pancreatic cancer, Yurgelun notes that pancreatic screening is still very new. “We hope it impacts outcomes and reduces mortality, but it’s too new to know for certain that it does,” he says. Our family has familial pancreatic cancer…my husband, his mom &her dad..and breast cancer on father’s side with our daughter Stage 3 Adenocarcinoma, husband’s sister and 3 aunts. But all they can say is the several genetic tags may or may not turn into cancer….so is there a familial link? We say yes but testing remains equivical…..